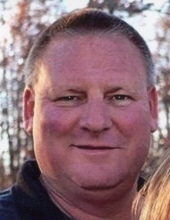 Roger L. Gerdon, 53, passed away Monday, March 18, 2019 at his home in Corydon, IN. He was born in Corydon, IN on March 12, 1966 the son of William “Bill” and Imogene “Katherine” Lutes Gerdon. Roger was a longtime car salesman who began at his family business, Gerdon Auto Sales and was a fixture there for 27 years. He then joined John Jones Auto Group where he worked another 8 years to the present. He was a member of the Eagles, Lions and Sportsman clubs and served as a past president in all for a period. Roger was also the President of Friends of Harrison County Youth for 15 years and coached peewee football through the Corydon Optimist Program. Roger influenced a lot of kids as a familiar face on Rice Island and his dedication to coaching Harrison County youth. Roger is preceded by his mother. His high school sweetheart and wife of 35 years; Teresa Rainbolt Gerdon of Corydon, IN, two daughters; Tabitha Seacat (Matt (1)) and Mallory Fletcher (Matt (2)) both of Corydon, IN, his father; Bill Gerdon of Corydon, IN, two sisters; Rita Pennington (David) and Teresa Crawhorn (Tom) both of Corydon, IN, six grandchildren; Hunter, Laken, Paislynn, Reese, Presley and Skylar. A Funeral Ceremony will be held at Noon on Thursday, March 21, 2019 at Gehlbach & Royse Funeral Home in Corydon, IN. Burial will follow in Perseverance Chapel UMC Cemetery in Corydon, IN. Visitation will begin Wednesday, March 20, 2019 at 12 PM until 8 PM and after 9 AM until the service at Noon on Thursday at the funeral home. In leu of flowers, memorial donations can be made in Roger’s name to; Harrison County Community Foundation; Lion’s Club, Dan Hardsaw Scholarship Fund, 1523 Foundation Way NE, Corydon, IN 47112 or donations will be accepted at the funeral home for Friends of Harrison County Youth. To send flowers or a remembrance gift to the family of Roger L. Gerdon, please visit our Tribute Store. "Email Address" would like to share the life celebration of Roger L. Gerdon. Click on the "link" to go to share a favorite memory or leave a condolence message for the family.